Darke County Parks will host a Fossils of Ohio program at 6:30 p.m. Nov. 15 at Shawnee Prairie Preserve’s Nature Center. 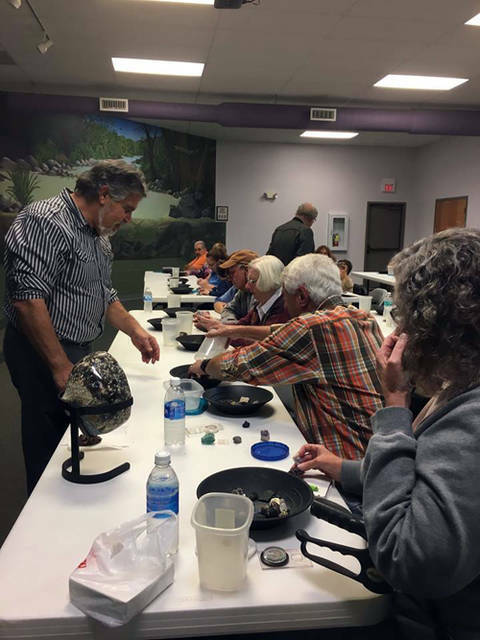 DARKE COUNTY – One of the most well-attended programs Darke County Parks offered last year featured the Mercer County Library’s Langsdon Mineral Collection. Darke County Parks is bringing Tony Rotondo and Glenn Hux back to Shawnee Prairie Preserve’s Nature Center at 6:30 p.m. Nov. 15 for the Fossils of Ohio program. Registration is required for this free evening of hands-on discovery, exploration and firsthand knowledge of trilobites, horn corals, cephalopods and other sea creatures. Guests will discover the geologic history of Ohio, the ancient sea that once covered this land and the remnants it left behind. Rotondo, Hux and the other members of the mineral team travel all over sharing their passion for rocks, minerals, fossils and geology. Their enthusiasm is contagious and will spark curiosity in adults and kids alike, organizers said.